Glaucoma is a complicated disease that causes permanent loss of peripheral vision and eventually to permanent blindness. It affects the pressure in the eye, called intraocular pressure. This intraocular pressure, or IOP, give the eye stability and rigidity, allowing it to keep its globe-like shape. But in some people, this pressure is higher than it should be, and this is called glaucoma. There are two different fluids in the eye: the aqueous and the vitreous humor. The vitreous is a thick, jelly-like fluid found in the posterior chamber, or back of the eye and keeps the retina attached to the back wall of the eye. Aqueous is a gel-like, clear fluid found in the anterior chamber or front of the eye between the iris (the color part of the eye that creates the pupil) and the cornea (a clear, dome-shaped structure that focuses 70 percent of the light entering the eye). Glaucoma affects the way the aqueous fluid drains from the eye. It can also affect how much aqueous is produced by the ciliary body. 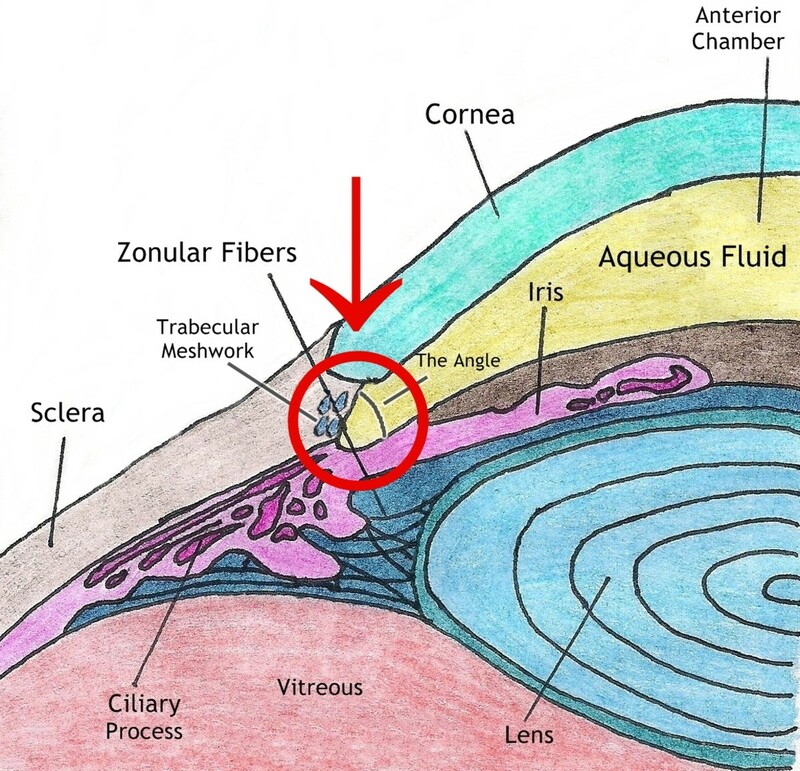 Aqueous is constantly replenished by the ciliary body which is located behind the iris next to the lens (see the above diagram). The fluid flows from behind the iris through the pupil and then drains out through the trabecular meshwork, a spongy tissue that creates a system of drainage tubes known as Schlemm’s canal and then the fluid flows out of the eye. Sometimes the ciliary body produces too much fluid, or the fluid doesn’t drain properly through the trabecular meshwork. This causes the pressure in the eye to rise. When the pressure in the eye goes up, it damages the optic nerve. 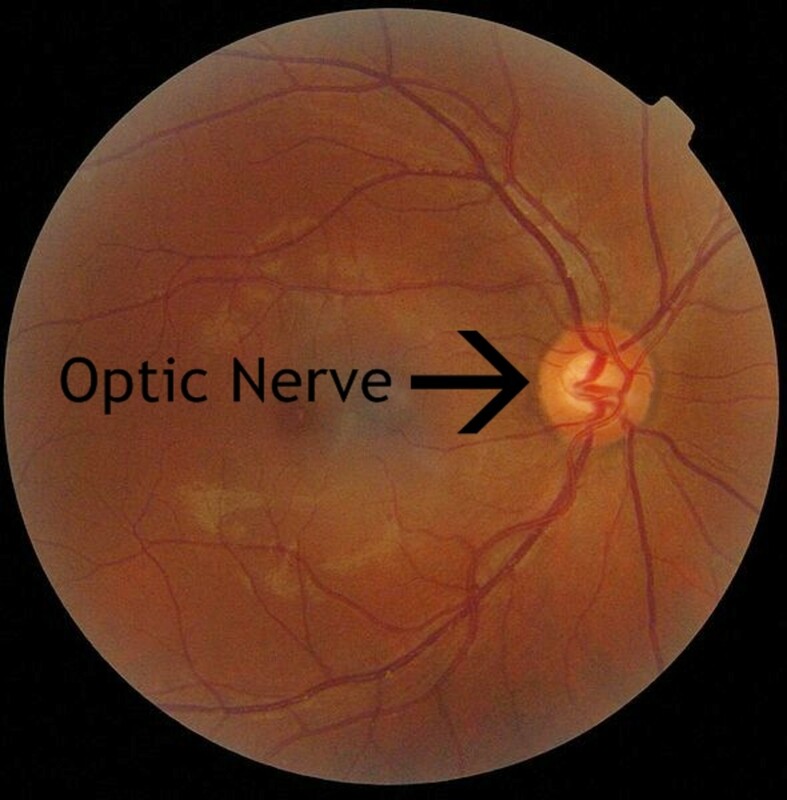 The optic nerve is a bundle of retinal nerve fibers found in the back of the eye. It connects the neurons that make up the retina to the occipital lobe of the brain. Each area of the retina corresponds to a specific section of the optic nerve. Essentially, the retina is a collection of neurons that culminate into a very long axon or tail at the back of the eye and exits the back of the eye socket and travels to the lateral geniculate body and then to the occipital lobe of the brain. The optic nerve is one of the longest nerve endings in the body. Normally, the optic nerve is flush with the retina, meaning it has a flat head where it exits the eye. But when the pressure in the eye rises, it forces the optic nerve to “cup.” The high pressure literally pushes the nerve fibers into the axon of the nerve, like when you punch a pillow. But unlike the pillow, the nerve fibers don't bounce back. 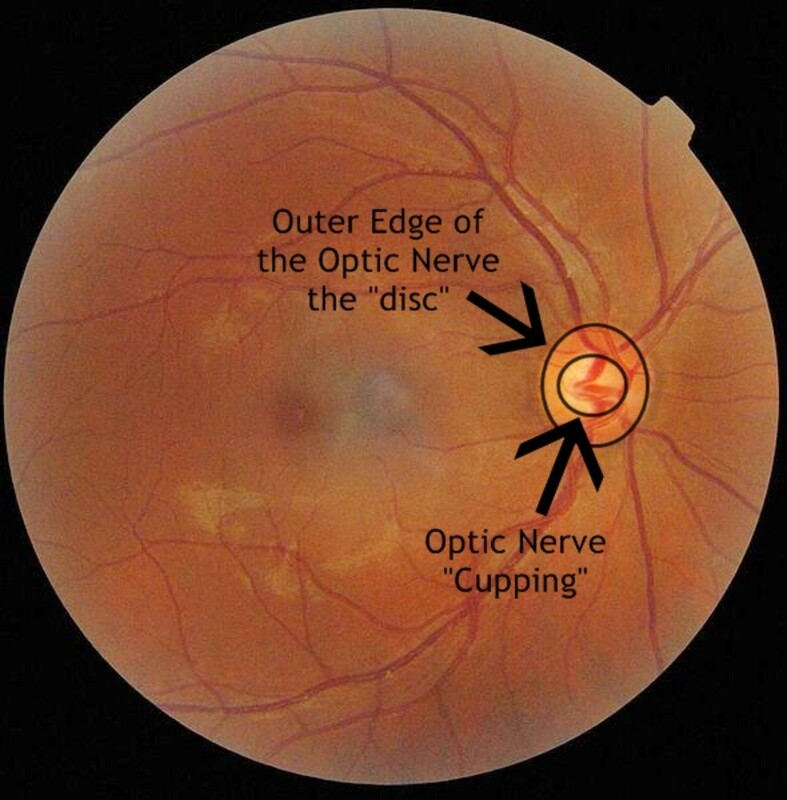 This creates a bowl-like appearance to the optic nerve, which results in the loss of peripheral vision because it damages the fibers that create the nerve. If we think of the optic nerve as a doughnut, the center hole would be the cupping created by the increased pressure, and the doughnut would be the rim of the optic nerve. The size of the doughnut hole grows as the pressure in the eye rises, which leads to permanent vision loss (see photo below). Narrow angle glaucoma is not as prevalent as its sister disease primary open angle glaucoma, but it is much more aggressive. It is the result of a structure in the eye called the angle being too narrow, as its name suggests. The angle is the space between the back of the cornea and the front of the iris (see drawing below). It is also where the trabecular meshwork is found. Trabecular Meshwork - Area of tissue near the iris that allows the drainage of aqueous humor from the eye through the sclera (white part of the eye). Aqueous Humor - One of two fluids in the eye that give the eye its shape and stability and provides nutrients to various avascular structures (parts of the eye without blood flow, like the cornea). Ciliary Process - Structure of the eye that produces aqueous humor and provides attachment for the suspensory ligaments that attach to and focus the lens. In most people, this angle is wide open, as in the drawing. Those of us in ophthalmology describe it as “wide enough to do the backstroke in.” In some patients, however, this structure is very narrow. Patients who are hyperopic (farsighted) have very short eyes, and this naturally puts them at risk for narrow angles because the structures of the eye are essentially compressed together. Myopic (nearsighted) patients have long eyes, causing the anatomical structures to be spread out. When the iris dilates, it folds like an accordion. In a patient with open angles, there is plenty of room to accommodate the bunched-up tissue of the iris. But in a patient with narrow angles, the iris can get stuck in the angle and block the aqueous from draining through the trabecular meshwork. When the iris gets "stuck" in the angle, it causes an extremely rapid rise in pressure. It's like a clogged drain in your bathroom, the water rises quickly. Intraocular pressure readings in patients with narrow angles can reach upwards of 70mmhg. In contrast, normal pressure is between 10 and 20mmhg. The highest I’ve seen in 22 years was over 85mmhg, and the tonometer stops at 88mmhg. The iris can also be bowed forward either by a cataract or by a buildup of aqueous. When this occurs, the iris blocks the angle resulting in a narrow angle glaucoma attack. In this instance, the occlusion may be progressive and happen slowly, rather than striking suddenly. But once the iris fully blocks the angle, symptoms will occur as in a narrow angle attack and may be more severe since the pressure will already be higher when the attack starts. If not treated promptly, permanent vision loss typically occurs within 24 to 48 hours. It's important to seek treatment from an ophthalmologist, not an emergency room, as soon as these symptoms occur. Doctors in an emergency room are not equipped to handle this condition, and waiting in an ER for a diagnosis is a waste of precious time and can cause permanent vision loss. The ER doctors will eventually send you to an ophthalmologist, but by then you may have already lost precious vision permanently. Always see an ophthalmologist for any eye problem. It is best to avoid the ER completely when it comes to the eye. Always go directly to an ophthalmologist for ANY eye problem. When it comes to the eyes, it is best to avoid ERs completely. Regardless of the situation, your vision is at stake. When Do Narrow Angle Attacks Occur? Most attacks occur after a patient enters a dark room, such as a movie theater, and the eye fully dilates, which is usually in about 30 minutes. 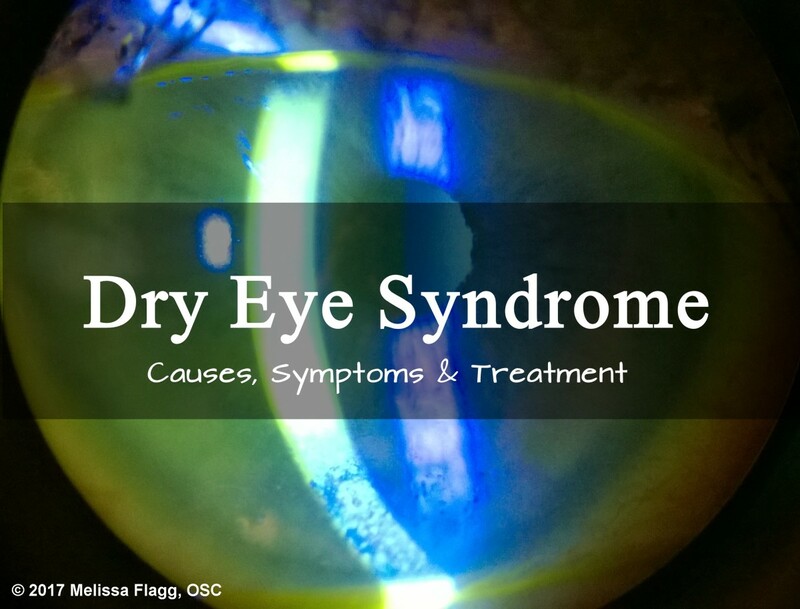 It can also occur when the eye is dilated artificially with drops such as Mydriacyl® or Cyclogyl®, which is why your technician should perform a slit lamp examination prior to instilling any dilating drops. The most common of these is an Nd: YAG Peripheral Iridotomy, or YAG PI (it is sometimes also called an LPI or laser peripheral iridotomy). This procedure involves using an Nd: YAG laser (neodymium-doped yttrium, aluminum, and garnet laser) to punch a small hole through the periphery of the iris. This allows the aqueous to reach the trabecular meshwork. An argon laser can also be used for this purpose; however, the YAG laser is much more common. The YAG PI is performed in the office after the patient has been given a drop of Pilocarpine. This drop is used to constrict the iris (make the pupil smaller) so that the doctor can find the thinnest part of the peripheral iris to treat with the laser. Because the drop forces the pupil to constrict by stimulating the iris sphincter muscle, it can cause the ciliary muscles to spasm which can cause a headache. This is a very common side effect of the drop and can be alleviated with typical headache remedies such as ibuprofen or acetaminophen. The procedure only takes about 10 minutes and can be painful. I have seen a number of patients flinch during the procedure when the hole is actually made despite the use of topical anesthetics. But the pain only lasts a few seconds. It is also not unusual for the doctor to hit a blood vessel in the iris when performing an LPI. If this happens you may notice what looks like a red streak on the iris when you look in the mirror. The body will eventually reabsorb this blood within a week or so; it's nothing to be alarmed about. Because the procedure is not invasive, antibiotic eye drops are not necessary. Most doctors will, however, prescribe a steroid eye drop such as Omnipred (generic name Prednisolone Acetate) to prevent any inflammation. Typically, only one eye is done at a time. The peripheral iridectomy is a surgical procedure performed in a surgery center or hospital that involves cutting out a wedge-shaped section of the peripheral iris. This serves the same purpose as the YAG PI and is usually used after a failed peripheral iridotomy, as a last resort. If you are treated for narrow angle glaucoma with a YAG PI it’s important to have regular eye exams to make sure the PI remains patent, or open. 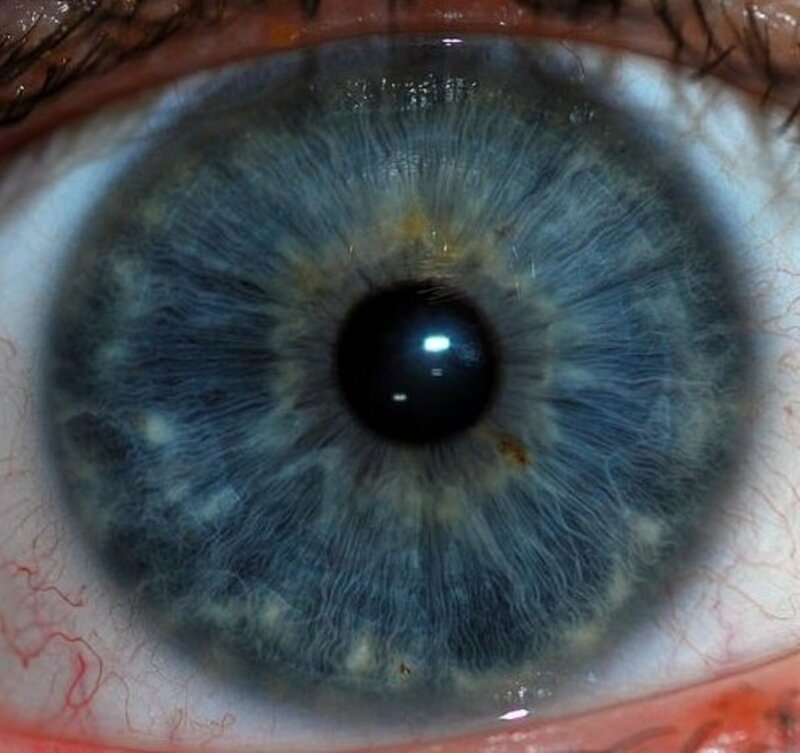 Although rare, there is the risk that the PI will become occluded by cellular debris or pigment from the iris. If this occurs, the patient will experience an acute angle closure. For this reason, many doctors put in an extra PI to act as a “safety valve.” If one becomes occluded, it’s highly unlikely both of them will become occluded at the same time. Remember to see your eye doctor if you suspect you have an eye problem. Seeing the ophthalmologist as quickly as possible can mean the difference between permanent blindness and a lifetime of clear vision. Don’t hesitate to call your eye specialist if you think something is wrong. If they won’t see you within 48 hours, it’s time to find a new doctor. After laser peripheral iridotomy surgery, what precautions are necessary? There are no restrictions after an LPI. It's one of the few surgeries that do not require any post-op restrictions, but you may be given post-op drops. Many surgeons prescribed anti-inflammatory drops like Prednisolone Acetate or Ilevro a few times a day, for 3 to 5 days after the procedure to prevent any excess inflammation. You will also be given a follow-up appointment to check your vision and pressure after the procedure to ensure everything looks good and is healing properly. May I take lorazepam if i have narrow angle glaucoma? LOL - I have a big grin on my face. 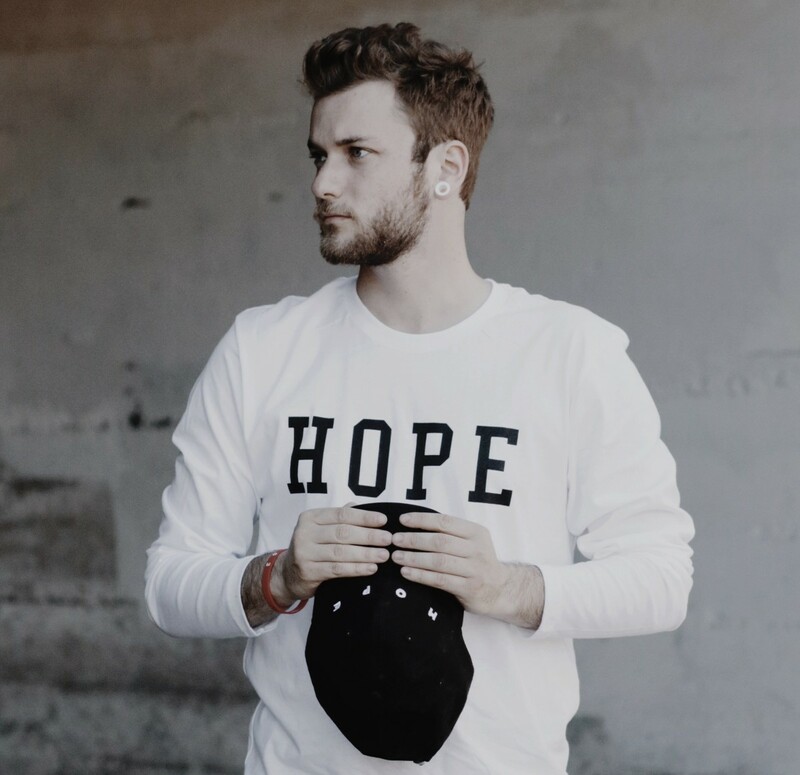 I do appreciate your responses and hopefully these comments will help others too. I will look into the Crystalens (no pun intended). Sounds like just what I want. I understand the issue with the muscles needing to flex the lens, but I never realized they atrophied. I guess wearing progressive lenses for the past many years didn't help–and my muscles didn't need to work anymore. That makes sense. No one else ever mentioned that. I'm going to start doing exercises ahead of time, such as trying to focus far without glasses. I'm sure I'll find some routines with a Google search. Once again, as always, thanks! I was warned about waiting too long also, for the same reason that you mentioned. I also had been researching the different lenses available. I agree with you, that I like being able to see tiny little objects close up. I do a lot of work with my hands and I wouldn't want to have to start wearing glasses to do close up work. But I also don't want to have to wear glasses for driving and enjoying nature after the surgery, which should be one of the advantages of post cataract surgery. Insurance will only cover standard monodical lenses. But I'm willing to pay the difference to get the multifocal lens implants so that I won't need to wear glasses anymore at all. I'll keep you posted when the time comes. Thanks again for all your help. I will tell you not to wait too long on the cataract surgery. If you meet the insurance guidelines for them to pay for it, I would have it now. The reason being the softer the cataracts are, the easier they are to remove, which means less inflammation post op. And because of your PIs, less inflammation means less chance of increased IOP after surgery. That's not to say you should go out and have the surgery done tomorrow. Definitely, wait until you're ready, but don't wait too long. Also keep in mind that you will lose all of your nearsightedness. I myself am nearsighted and LOVE it. I do a lot of close work and would not be able to live without it. If you're anything like me, this will be an issue when you go to have cat surgery. I would recommend talking to your doctor about a monofocal lens set for a nearsighted distance so that all you have to wear are distance glasses. Monofocal lenses are typically set for distance so that you have to wear reading glasses, and in 21 years I've never had a myope say they're glad they're no longer nearsighted! Glad I could help Glen! Thanks for taking the time to give me such as detailed answer Melissa. You definitely made things clear for me to know what to expect, as well as what to insist on from my doctor. I'll let you know how things go when we get closer to the surgery. As I mentioned, I think it won't be for another year, although my doctor insists my cataract is progressing rapidly. But I'm not aware of that. I figure as long as I can drive at night without any major issues, I'm can wait. I have friends who say they can't even drive at night anymore. While I agree with your doctor, you don't have to worry, he really could've gone into more detail. As with any surgery, there's always a risk. But you'll actually have more of a risk of a retinal detachment (RD) than you will a complication with a PI. Since you've already had a PVD (vitreous detachment) it's much less likely that you'll get an RD, but it's still a risk, but it's also a risk for everyone who has cat surgery. Since cataract surgery removes the lens behind the iris, when the surgery is performed, it is a possibility that more pigment than usual will shake off the iris. We use a process called phacoemulsification to break up the cataract and vacuum it out, and that uses ultrasound. Obviously, the vibrations from the phaco procedure will cause more pigment to "fall" off the lens (for lack of a better term), and the pigment will float around in the anterior chamber (in front of the iris). This does increase your risk for a post-op increase in pressure because, after cat surgery, the immune system starts its natural healing process which releases white blood cells into the anterior chamber. These cells can attach to the pigment cells causing larger clumps, and that can cause an issue. But because of the PI, it shouldn't be a problem, unless these cells end up blocking the PI. It's very unusual for this to happen, but I have seen it. Normally, we give several drops after cat surgery to help prevent excess inflammation, and your doctor may even put you on a glaucoma drop temporarily just in case (it depends on how conservative he is). You will be seen one day after the procedure, so should the pressure go up, it can be treated right away. 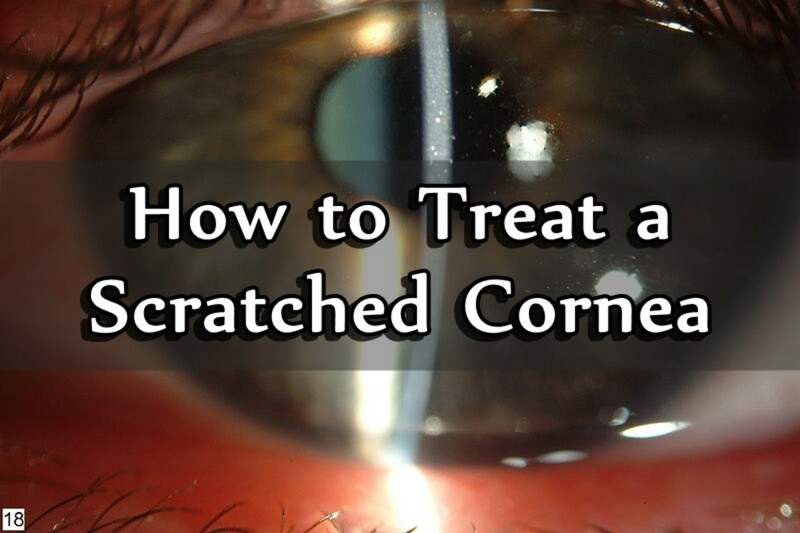 A simple procedure called a paracentesis can be done in the office at the slit lamp to relieve the pressure. It involves using a tiny needle to literally poke a small hole in the wound from cat surgery to allow the aqueous to escape. My doctors typically put a patient on a glaucoma drop for the duration of the healing process if they have to perform this procedure, but every doctor is different. Normally after about 4 weeks, the eye is healed and the risk of increased IOP drops considerably. If you have any other questions don't hesitate to ask! Wow, that was a very detailed answer in your prior comment, and I'm grateful for that. You made it clear what's going on with my glaucoma. In my case I only have one PI in each eye. I had the second eye done a few years after the first when the pressure started going up there too. I do have regular checkups and the doctor always checks to be sure the PI is still open. By the way, I am myopic as you had indicated. As a matter of fact, I also had a detached vitreous in both eyes already, as is common due to the elongated eyeball in nearsighted people. I have another question for you Malissa. I am about one year away from needing cataract surgery. I asked my doctor if my PI might cause any complications with the cataract surgery. All he said was, "don't worry." But I'd love to have a better answer. What are your thoughts on that, considering the type of glaucoma condition that I have. Hi Glen! For the most part, narrow angles and pigmentary glaucoma are two different types of glaucoma. Narrow angle glaucoma is a primary, meaning it is the only cause of the glaucoma. Pigmentary glaucoma is a secondary because it is caused by excess pigment in the iris and the trabecular meshwork. But pigmentary glaucoma is a type of primary open angle glaucoma, which can make this confusing. Let me explain. In very nearsighted, typically male patients, the iris rubs against the lens zonules (which are behind it) due to the length of the eye. Because in nearsighted people, the eye is longer, the angle is especially wide which causes the iris to be concave rather than flat. This wide angle also allows the iris to move a bit which is what causes the rubbing. 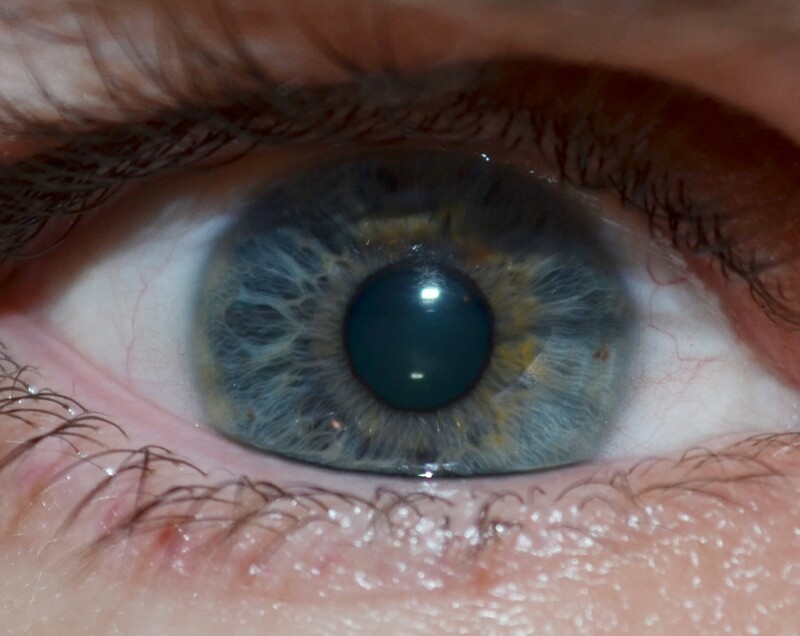 Because there is already excess pigment in the iris, it flakes off as the iris rubs against the lens. This pigments often sticks to the lens, some of it floats around in the anterior chamber sticking to various structures like the trabecular meshwork in the angle and the back of the cornea forming a classic sign called Krukenberg's Spindle (it's a spindle-shaped line of pigment in the center of the corneal). The loss of pigment in the iris also causes what is called transillumination defects (using the light of the slit lamp, the iris is illuminated by bouncing the light off the retina and onto the back of the iris showing defects where the loss of pigment has occurred, it's pretty cool... lol sorry). 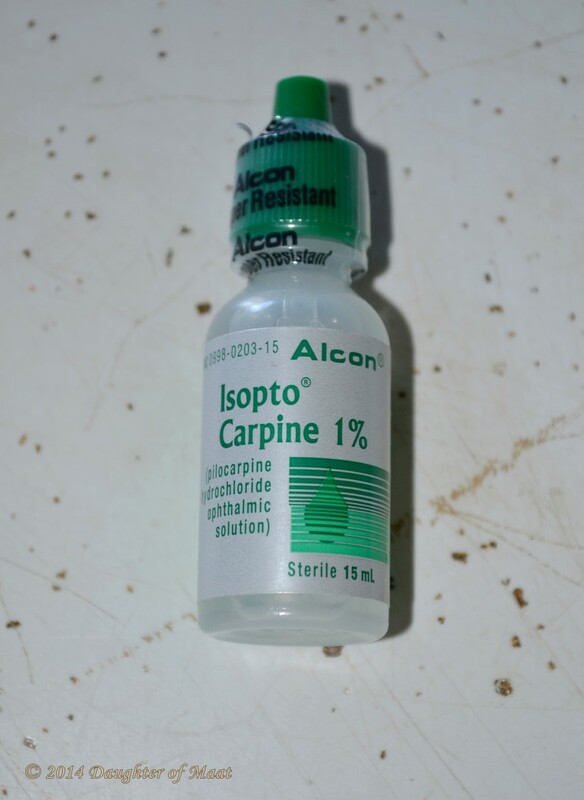 The first line of treatment used to be miotic eye drops that shrink the pupil such as Pilocarpine. But in recent years, ophthalmologists have been treating pigmentary glaucoma (also called pigment dispersion syndrome) with an LPI. As in narrow angle glaucoma, an LPI prevents the trabecular meshwork from being completely blocked, so it works well for this type of glaucoma. However, because of the constant sloughing of pigment, the iridotmy can also become closed off, which is why it's important to have checkups with your doctor so they can check to make sure the PI is still open. Many doctors (the ones I work for as well) put in a secondary PI as a safety valve. But it too can become clogged with pigment. So the short answer is no, you do not have both types. I hope that helps!! Melissa, I learned a lot from your article. My doctor explained to me that with my narrow angle glaucoma, the iris rubs against the cornea, causing the pigment to rub off and clog the drainage—resulting in the higher pressure. For this reason, he also called it pigmentary glaucoma. So I'm a little confused. Do I have both narrow angle glaucoma and pigmentary glaucoma? Or are they really the same thing? In any case, I had Laser Iridotomy done, which has helped keep the pressure under control now for over ten years. Recurrence doesn't actually apply. Since it's an anatomical condition, there is no "cure." The laser procedure will prevent any narrow angle glaucoma attacks and prevent vision loss. Marijuana can not be used to treat glaucoma in any form despite popular belief. DX'd w/Narrow Angle Glaucoma, ophthalmologist after 2X annual checkups the last 2yrs scheduled laser procedure for next month 1 eye @ week. Is recurrence common ?If yes,does marijuana ingestion a viable impediment against such recurrences? Thank you for this article at 46 and yearly exams I was shocked to find out I had narrow angle glaucoma. Anything with pseudophedrine or phenylephrine in it. 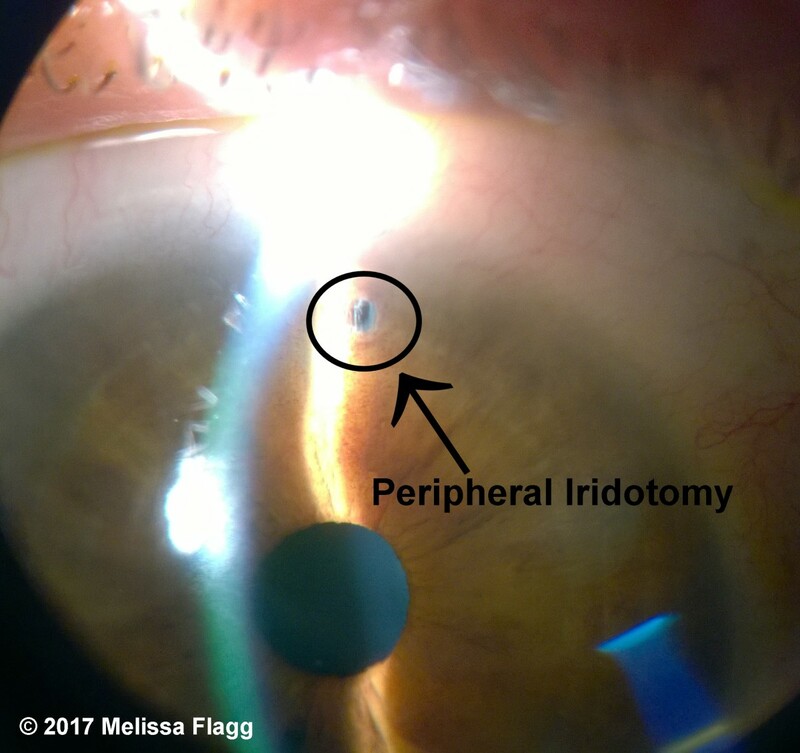 Your doctor should perform a peripheral iridotomy prior to cataract surgery since the eye needs to be dilated in order to be able to remove the lens. Removing the cataract will open the anterior chamber, but if the chamber is so shallow that dilating the eye will cause an angle closure, a PI (peripheral iridotomy) should be performed first. Hope that helps! Thank you Melissa for this extremely helpful article. My mom was recently diagnosed with very shallow Anterior Chamber both eyes and recommended cataract surgery to alleviate the same. 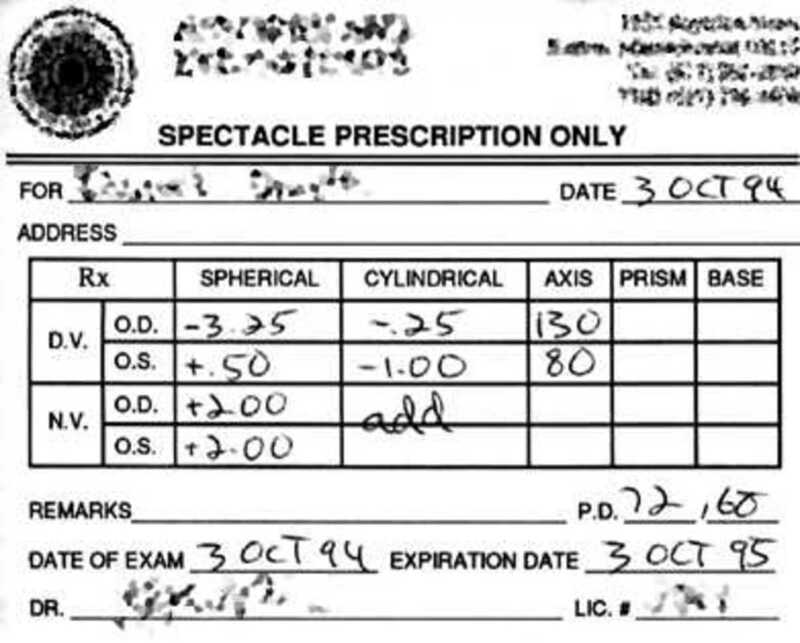 Eye pressure was 14 and vision is good with glasses. She is 68 yrs, hyperopic, and generally in good health. We are getting one eye cataract surgery done this week. Do you have any words of advice or caution? The diagnosis was a surprise and I feel we panicked and rushed to schedule the surgery. Your input is much appreciated. Thanks for writing back. Still totally freaking out. I asked Doc if constant crying did it and he said no. Worried about being worried. Eye exam Jan 2014 measured eye pressure to be 15 and 22. Feb 2014 it was 14 in both eyes. Planned to have a Yag-Pi in April but canceled it and seeking second opinion advice since a dramatic drop in eye pressure is unusual. surgeryencyclopedia; "The iridotomy can be a complete failure if don't have pupillary block but plateau iris. Many unnecessary iridotomies result in severe adverse effects of glare, white lines, double vision, permanent inflammation and IOP." 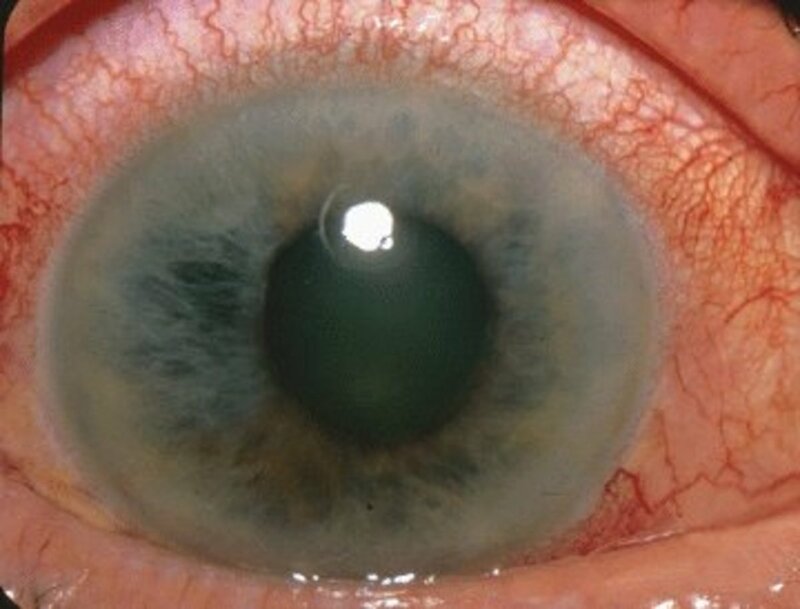 webeye.ophth.uiowa; “Plateau iris syndrome is uncommon but mostly seen in young adults." On ncbi.nlm.nih; “Patients who have LPI are at greater risk of requiring therapy to control IOP, even if they have a successful procedure. ... Yag-pi increases the frequency of having cataracts. .. Exfoliation syndrome, is vastly under-diagnosed and could explain a rise in IOP after an an iridotomy. OMG! Thank you for writing this!!!!!! I went to the eye doc and in one eye it's 14 & the other eye is 22. I go see the eye surgeon to see if I get the hot poke in the eye. Damn!!! It's gonna hurt?!?!?! I didn't think it would hurt. I thought there were no nerve endings. Anyway. I starte crying in the eye doc and then I tried to calm myself done saying - it's only one eye, but it looks like they will do two, for good luck. Thanks. I freaked out thinking about "A ClockWork Orange" with the eye springers and hot pokers warmed over the fire. Arrrrrhggghhh!!. Thanks. I needed this article. Thank you Pamela, it's a tough topic to write, so for someone who has no experience with the topic to say that I wrote a good article means I did it right! Thank you!!! This is an interesting article about glaucoma. I don't know of anyone in my family with this problem, so this was mostly new information for me. Very well written article.